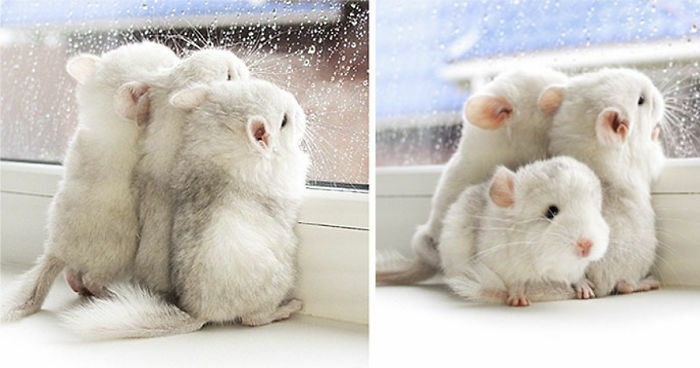 Chinchillas are, without a doubt, one the cutest animal species ever. With their bushy tails, tiny ears, long whiskers, and adorably fluffy fur, the little creatures can truly make you say "awww". In fact, it is said that their fur is the softest out of all land mammals! So, to celebrate the beauty of these little rodents, Bored Panda has put together a list of cute baby chinchillas. Keep on scrolling to take a look, and feel free to add your own pics to the list. But beware - it's a cuteness overload waiting to happen! I would just hold them, rub them against my face and make squeaky sounds. Too cute to handle! Oh, tiny thing with such soft looking fur. Want. I really hope this is a full sized shopping trolley, and that is a GIANT Chinchilla!! Beautiful shot of a beautiful little animal. I will love him and hug him and call him George...and George II. When you've just woken up. Bet he's a smart one! Oreo looked like this as a baby, so cute! Don't normally like the over-staged photos but I'll make an exception for these! They are all adorable! How hard is it to care for such exquisite tiny beings like chinchillas?? Save the Chinchillas, no more Chincilla accesories! Aw, looks like he's stumbling around, having just woken up, and can't find the door... or maybe it seems that way to me as that's how I am in the morning. Although without the cute furry coat and tail. Oh, to be as cute as a baby chinchilla. Aw, this one's got a bit of a punk hair-do going on! That's a reference to the music type and not the North American definition of the word punk, I hasten to add! Too cute for it to be the latter meaning. The one on the right looks really surprised!